Hand made mobile earrings made up of boomerang shaped sterling silver pieces created by Ruth Berridge of New York City, New York. Clip back earrings measure 3" in length. Signed Berridge, Sterling. In very good vintage condition. 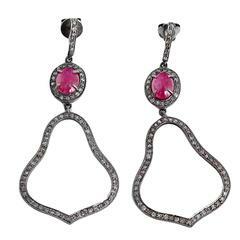 These amazing earrings each feature a ruby cabochon with diamonds set in oxidized sterling silver. Earrings measure apx. 2-3/4 inches in length. Total weight is 8.5 grams.